All our Pilates Equipment-based classes are small group classes (4 people maximum) working on the large fixed Pilates machinery. As our classes are limited to only four students, the highest quality focused tuition is provided but with the camraderie of a group class. We ensure that you each work to your own body’s specifications whilst learning the exercises with proper technique so that you reach your full potential. 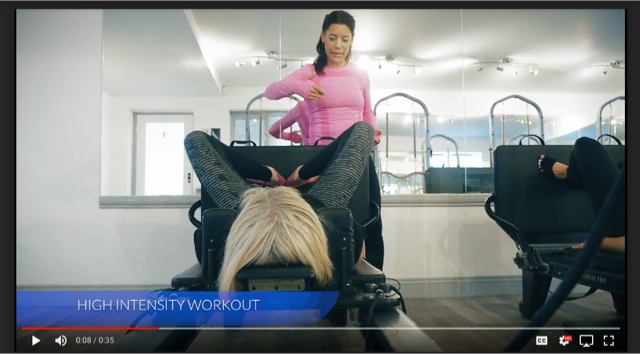 All the machines can be used both for advanced exercises to provide a real challenge to athletes or can provide gentle safe work-outs for first-time exercisers or those with limited movement. To establish your class options (and if you are a beginner, introduce you to the machines), you will need to book an Initial Appointment prior to attending any Pilates Equipment based sessions. This initial appointment is charged at concessionary rates: £40 (for 45min) private or you may wish to share with a friend and pay £25 each (for 55min). The Reformer is the most well-known and regularly used piece of equipment. An amazingly elegant design, it can replicate nearly all the work on every machine on a typical gym equipment floor in multi-dimensional planes. Reformers provide variable resistance that allows precise alignment and work on core strength. Loading and positioning can be easily adjusted for comfort. Jump boards fitted to the end of a reformer provide cardio workouts and are particularly effective used for tabata-style HIIT training. Integral headrests and a variety of props ensure comfort and/or added challenge. The towers fixed upright on the Reformers at ONE GROVE are Half-Cadillacs. A cadillac looks like a four poster bed and is the ultimate set-up for ballet dancers and gymnasts. The Half-Cadillacs or Cadis encourage stability and provide a universe of exercises for arms, shoulders, back and legs. Because the tower is combined with the reformer, the moving carriage can incorporated into the workout too. Split-pedal Combo Chairs or ‘Wunda chairs’ are brilliantly simple- comfortable to sit down and exercise on and versatile to move around on in every direction: your front, back, sideways and standing so that the body is working in every plane. The chairs are excellent for arthritic adults, pregnant ladies, hypermobile bodies and hearing-impaired clients. The chairs provide both some of the hardest and the easiest exercises in the Pilates repertoire. The arc barrel has been designed as a spinal support and as a spinal corrector. It can be used as an aid in mat exercises, placed on the reformer for lumbar support or used with its own specific repertoire of exercises, some of which are modified ladder barrel exercises. Its gentle curve helps decompress and lengthen the spine one side; its asymmetry ensures a match for different body types. The Arcus is a tactile bar with attachments to the larger equipment which helps to open out the back, to release shoulder tension and to challenge regular leg work. Hand-crafted in the USA, the Arcus was developed by Trent McEntire, a leading Pilates instructor who is renowned for continuing Joseph Pilates’ quest to better movement through the body by devising new exercise tools. What Equipment Classes are available? Each student in this class has their own Reformer Cadi, Arcus bar and Arc Barrel. Students work on exercises together. We are looking to set-up these classes if there is demand. 4 students work on reformers whilst 4 students work on towers and chairs. The class swaps stations half-way through. Remember that you will need to book an initial appointment with us first before being allowed to attend any Pilates Equipment based sessions.